Aeromium Barcode Fonts is a set of high quality, professional and premium barcode fonts for your organization. Each of the fonts has been carefully developed and crafted to ensure maximum scannability and readability. The barcodes supported are used and adopted commonly in many industries. All the barcode fonts have been designed to meet strict industry specifications, including the latest SUNRISE requirements. The following Barcode Fonts Formats are available in the package: TrueType Type 1 Together with existing TrueType barcode fonts, this software package enables users to create barcodes in many different applications such as Microsoft Excel, Microsoft Word, Wordpad, Crystal Reports, Adobe Photoshop, Adobe Illustrator and other graphics editor. 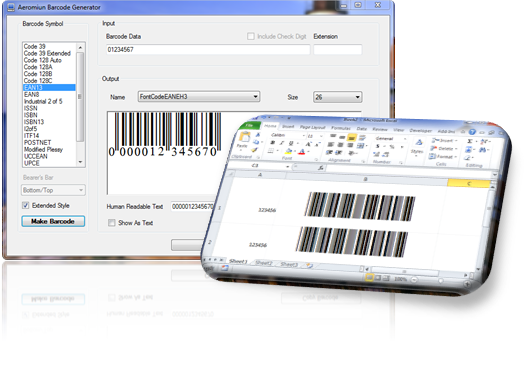 This software package is bundled with a standalone Helper application that can verify input data, generate check digit and translate input characters into barcode characters which adhere to all the stringent barcode industry requirements. In addition, this package also comes with Visual Basic for Application (VBA) Formulas that enables flexibility to generate barcodes in Microsoft Excel and Crystal Reports. This package further includes a .Net Software Development Kit (SDK) to allow developers to easily integrate barcode generation into their bespoke applications. Types of Barcodes supported: Code39 Code39 (Extended/Full ASCII) Code 93 Rational Codabar Code128 Auto, Code128A, Code128B and Code128C GS1 128 (UCC/EAN) Industrial 2of5 Interleaved 2of5 ITF14 European Article Numbering 13 (EAN13) European Article Numbering 8 (EAN8) Modified Plessy (MSI) Universal Product Code A (UPCA) Universal Product Code E (UPCE) International Standard Book Number (ISBN) International Standard Book Number 13 (ISBN13) International Standard Serial Number (ISSN) Extension 2 (EXT2) and Extension 5 (EXT5) This new version includes a barcode maker to generate professional quality barcode images. Top 4 Download periodically updates software information of Aeromium Barcode Fonts 4.0 full version from the publisher, but some information may be slightly out-of-date. Using warez version, crack, warez passwords, patches, serial numbers, registration codes, key generator, pirate key, keymaker or keygen for Aeromium Barcode Fonts 4.0 license key is illegal and prevent future development of Aeromium Barcode Fonts 4.0. Download links are directly from our mirrors or publisher's website, Aeromium Barcode Fonts 4.0 torrent files or shared files from free file sharing and free upload services, including Rapidshare, HellShare, HotFile, FileServe, MegaUpload, YouSendIt, SendSpace, DepositFiles, Letitbit, MailBigFile, DropSend, MediaMax, LeapFile, zUpload, MyOtherDrive, DivShare or MediaFire, are not allowed! Your computer will be at risk getting infected with spyware, adware, viruses, worms, trojan horses, dialers, etc while you are searching and browsing these illegal sites which distribute a so called keygen, key generator, pirate key, serial number, warez full version or crack for Aeromium Barcode Fonts 4.0 download. These infections might corrupt your computer installation or breach your privacy. A keygen or key generator might contain a trojan horse opening a backdoor on your computer. Hackers can use this backdoor to take control of your computer, copy data from your computer or to use your computer to distribute viruses and spam to other people.